She came to choose a puppy. Thankyou for working with us all. 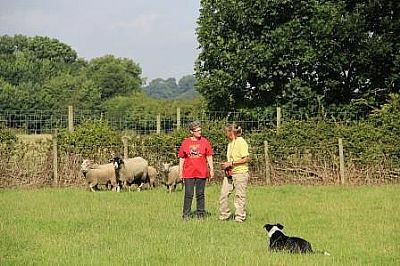 She worked with a border collie, Sam, and Maggie. A beardie with Liz called Beattie. A Pyrenean sheepdog, Celeste, and Eion. 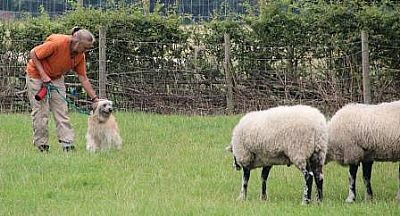 Sometimes, at some stage, confronted with an owner and a trainer asking for something a bit differant, not on the dog's own agenda, the dogs 'quit' briefly, move away to the gate or water trough. She was reassuring about this, it is not just one, its all will do this at some point. 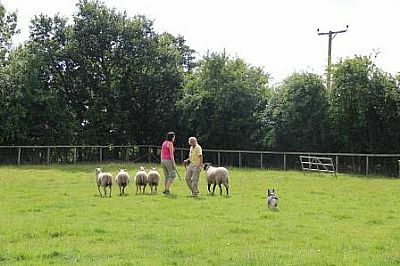 Solutions included walking out the field yourself, or involving the dog in a seriously boring Sit Down St down obedience exercise, and generally improving the dog's 'work ethic' in everyday life; ie. improved attention and resposiveness at home. A boxer demonstrates the Five Yard rule perfectly! This was something Lynn introduced last time. 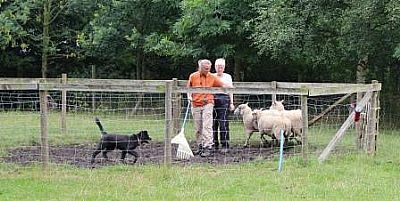 It introduces the concept of the dog itself taking some responsibility for the sheep's pace and position, not racing past the handler. 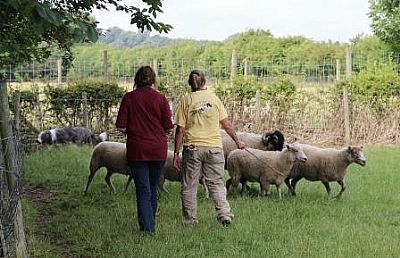 When owner and dog understand and implement it, it improves the owner's 'status' as 'posessor' of the sheep, improves the dog's relationship with the handler in the whole sheep managing process. It also helps balance and control in later exercises involving driving and fetching. Another Boxer. Eyes off, Bob, Please! Bob, like all the dogs this time, met Lynn two years ago. 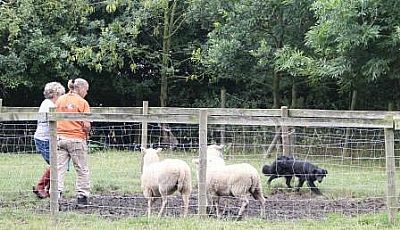 He has had very little practice in between, and we saw the technique used that breaks the intense eye contact and releases pressure on the stock from the dog. This helps both relax, and calm movements become possible. 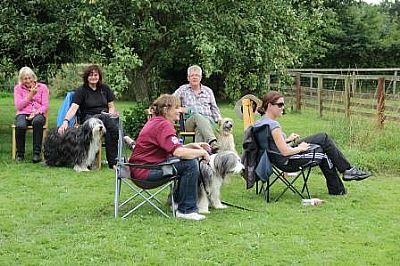 Relaxing, this dog training! 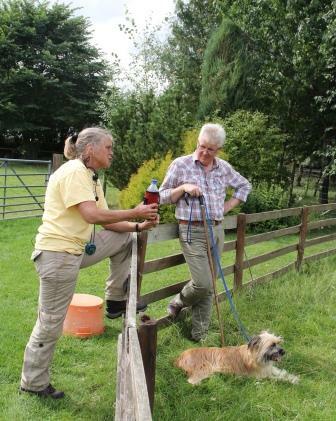 One thing Lynn was firm about was NOT peeing on the job... dogs, that is... 'Would you accept it if he/she pissed on the dining room table?' 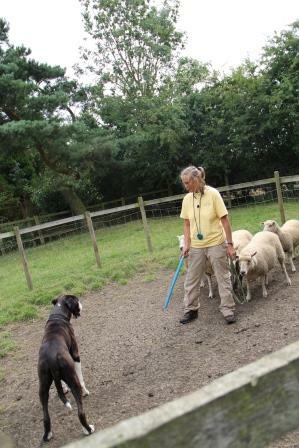 The work area is not a toilet, walk dogs before work and react strongly if they stop work to relieve themselves. 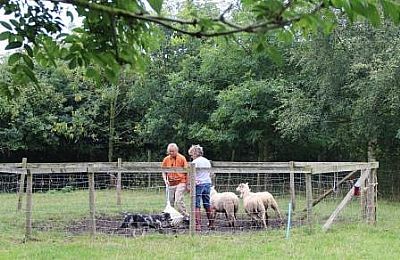 Willy with Lloyd, another beardie, from Belgium, working on the five yard rule, putting the leading sheep back behind Willy. Liz's Australian shepherd puppy Pitch, her first into! 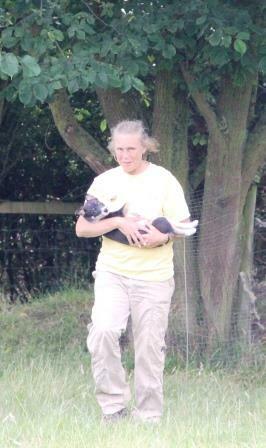 and sister, Chimp, too with Lynda learning where to be! and another little Pyrenean, Pia. There was a neat technique for calm outruns, and lots of surport on how to get and keep good stops. Brilliant! I have jotted down the things that I remember best, but we will get together next weekend to really debrief! Please all bring your notes !